A sound mirror in Gibraltar? 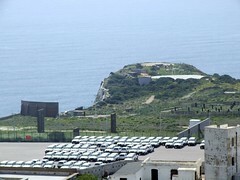 Gibraltar 2007 – Sound Mirror? Paul Wells of doverpast.co.uk has found something in Gibraltar which looks rather like a sound mirror. But is it, or is it something else? The only sound mirror to be built outside England is a 200 foot example in Malta. When I visited the country earlier this year, I couldn’t miss out on the chance to go to see it. Here are some photos and some background details of its history, and also details of how to find it.